I started the story of a dinner party the other day, and here it continues with two more parts of the meal including an asparagus salad and seafood paella. I thought I knew paella, but I learned so much more from The New Spanish Table . For authentic Paella Valenciana, you must use the proper rice and cook it in a wide, flat paella pan outdoors over a fire of burning vine branches or orange tree shoots. It contains chicken, rabbit, possibly duck, and occasionally vaquetes, which are land snails, but never seafood or chorizo. Traditionally, the only allowable additional garnishes were flat green beans, artichokes, and butter beans. The focus of the dish is always the rice. There’s also a suggestion that paella is only for lunch and never for dinner, and any dish that includes those other ingredients like seafood should be called something other than paella. To be named Valenciana, it has to be exactly right. Clearly, I didn’t really know paella at all. The good news is that there are also recipes in the book for ‘paellas’ which make no attempt at being by-the-book, traditional Paella Valenciana. I decided to make one of those, chiringuito seafood paella, which Von Bremzen describes as ‘a minimalist affair, with few other ingredients besides seafood and rice.’ The one important garnish, which I almost completely forgot to serve, was the saffron allioli. Before I get into the specifics of making the paella, I also wanted to show a simple asparagus salad I served while the rice simmered. This is called asparagus on asparagus, and it’s another playful and easy dish from Happy in the Kitchen . You start with a bunch of peeled asparagus and set four spears aside and then cook the rest until tender. Those were left whole and chilled. The four reserved spears were chopped and added to a saucepan with a little water and olive oil. They were simmered until very tender and then pureed with dijon mustard, lemon juice, and salt. 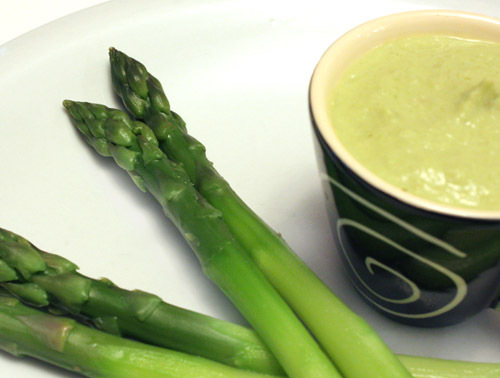 What results is a thick asparagus sauce which was served in cups for dunking the whole, chilled spears. So, back to the seafood paella. 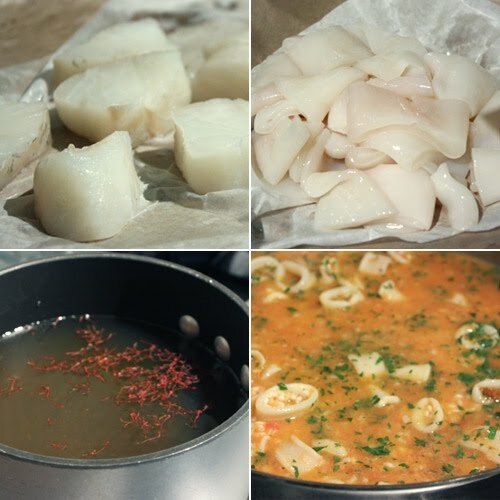 I prepared a shrimp stock and cleaned and cut the seafood in advance. The stock was warmed with some saffron while the paella prep began. Olive oil was heated in a large saute pan because I don’t yet own a proper paella pan, but now I really want one. The recipe suggested using monkfish, but that’s not a sustainable choice and is on the avoid list right now. I used true cod instead. Cod, cut into one-inch pieces, was added to the olive oil and seared for about a minute. It was removed from the pan, and squid tubes cut into rings were added. The squid was seared and then pushed to the outside of the pan. More olive oil was added to the pan, and minced garlic was cooked until fragrant. Tomatoes that had been grated on a box grater were added followed by some paprika. Then, the rice was added. In the book, there’s a thorough explanation of types of rices to consider for paella. The most reliable and easiest to locate is Italian Arborio rice, and that’s what I used. The rice was stirred in the pan until well coated, and then the warmed shrimp and saffron stock was added. From that point on, the rice was no longer stirred. The pan was shaken to distribute the stock throughout the rice, but otherwise, the rice was left to cook undisturbed. Chopped parsley was added, and after about five minutes, the cod was returned to the pan along with some littleneck clams. Once the stock had absorbed down almost to the surface of the rice, the pan went into a 425 degree F oven for 15 minutes. The pan was then removed from the oven, covered, and left to sit for five minutes. The lid was removed, and it was left to sit for another five minutes. The sitting improves the rice. While it sat, shrimp were sauteed in a separate pan with some minced garlic. The paella was served in the pan with the sauteed shrimp on top with no garnishes other than some lemon wedges. I wasn’t sure I had seasoned the rice carefully enough during the cooking time, but the seafood, and particularly the clams, added such a nice taste of the sea that it worked out fine. Just as everyone was taking their last bites, I realized I had completely forgotten the saffron allioli which was to have been served with the paella. Our guests, and this is truly a sign of the best kind of dinner guests, said ‘go get it, let’s have a taste!’ So we all piled one more scoop of paella onto our plates and topped it with the allioli. The garlicky, saffron-scented, thick sauce added a lovely something extra, but the plain paella wasn’t bad at all on its own. Up next, I’ll show dessert. Love this Lisa, the saffron allioli makes my mouth water. Beautiful dish! Who can say no to paella? Not me. Thanks also for testing the asparagus and asparagus dipping sauce for us. I have seen that recipe in Happy in the Kitchen, but it's one of those I've never tried. Glad to know you like it. Stunning! I love the sound of saffron allioli. Wouldnt it be great in a sandwich? I love Paella but have never tried my hand at making it! I love this post. I almost feel like I was at this wonderful dinner party! Yummy! Everything looks lipsmackingly good! I love paellla, of course...and that looks awesome...but saffron aioli?! Holy cow...I'd eat my own liver with that stuff! Beautiful post. Wonderful clear direction and incredible attention to detail. Really well done. 10 out of 10. Cheers! This looks like the beautiful meal my husband had in Italy. MMM this dish looks wonderful. Every time I visit your blog, it's like going to a 6-Star restaurant! This dish is making me salivate. Saffron aioli sounds very interesting. asparagus dipped in asparagus, what fun! this is a complex and well-prepared feast, lisa, but i'm looking forward to dessert! Apparently I don't really know paella either...what have I been cooking all this time! I would love to try this more authentic version...it looks delicious! Paella with aioli sounds fantastic! Paella is my go-to dish for company. It is so easy to make for a group and everyone loves it. Interesting aioli! I confess, I've never made a paella! I've sure eaten my share though... had a marvelous one in Venice once, I'll never forget it! This recipe looks like something I could manage! And I certainly will make the aioli ASAP! Your paella looks mouthwatering and now all I want to do is have it for breakfast lol! :P Cereal or paella? Hmmm, my breakfast pales in comparison! 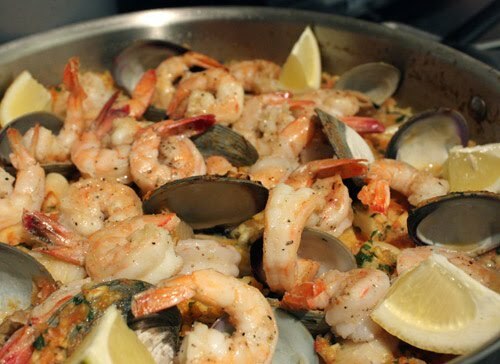 The seafood paella sounds incredible and I just love the idea of saffron allioli! Lisa, your paella rocks! This was awesome. Talk about a dinner party that I would have enjoyed attending, I think this would be the one. Paella looks amazing and love how its brimming with seafood. Chilled asparagus is so good on warm spring nights. I've got some green and purple asparagus so I might try it your way this wknd. The dijon sauce looks like the perfect accompaniment. Your paella looks absolutely gorgeous! Must taste heavenly especially served with saffron allioli! The paella looks wonderful! I especially love the sound of that allioli! The asparagus is very clever too with the dipping sauce. It is the best kind of dinner host that has saffron aioli in the fridge! The paella was stunning, with and without the aioli. 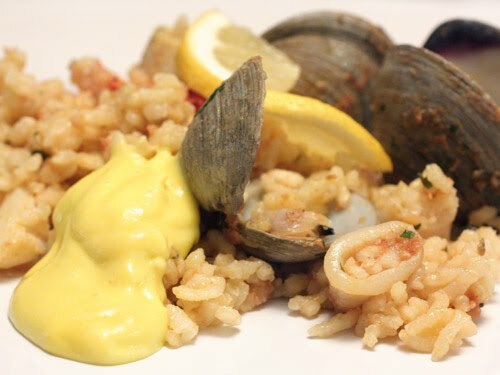 I have to get that book and start playing with Spanish food more, as we are going to Spain in the fall with my son...the aioli with the paella looks great! I swear nothing compares to a good paella and I feel I am looking at one now. Love how the menage of flavors all come together. Perfect party food or just to feel like you're having a party. I love asparagus so it goes without saying that your asparagus on asparagus sounds simply amazing. Now you got me really hungry both for asparagus and for the paella which I have not made in a long time!